Surrounded by the Indian Ocean, Mauritius is ideally positioned to access the many exciting species of fish that frequent the warm, tropical waters. Since its early days fishing has had a significant part in every-day life of the local Mauritians. Still today when travelling along the many beaches of Mauritius you are sure to find many fishermen standing inside the lagoons and trying to catch some fish to bring home to their families or to sell at the local markets. 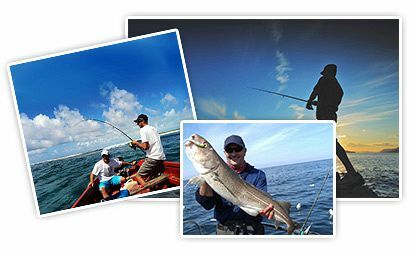 Of course, throughout the years, with the increase in the number of visitors to the Island the game-fishing industry has developed to the point that one can enjoy large variety of exciting fishing trips in Mauritius. As part of any fishing trip in Mauritius, in addition to the fishing adventure itself, you will get to enjoy breathtaking views of the lagoons and of the many small islets (small islands) surrounding Mauritius – a great adventure for itself. For the non fisherman, it is a great opportunity to enjoy a day of sailing and fun. *In case you are interested in any of these fishing trips and you could not find the trip details on our website, then please Contact Us and we will be happy to provide you with all the information and prices on your desired trip. In addition to having types of fish that are not readily available in other areas, Mauritius also has varieties of fish like Bonito and Dorado that are popular in many other locations, but are much bigger in Mauritius. A Mako shark that weighed in at 1115 pounds is a nice example of Mauritius' abundance of big fish! Depending on the time of the year it is also possible to catch Blue or Black Marlin, Sailfish, Wahoo, Yellow fin Tuna, Giant Trevally, Dogtooth Tuna, Bonito, Dolphin fish, Sharks and many more. If fishing for tuna could appeal to you, you might be interested in knowing that Mauritius has claimed Yellow Tail tuna and white tuna of well over two hundred pounds each! For any fan of fishing, deep-sea fishing is a spectacular experience in Mauritius any time of the year making it one of the most ideal places for deep-sea fishing in the world. Deep-sea fishing is one of the most exciting adventures you can possibly have, so it is absolutely essential that you schedule some time for it when you are planning your Mauritius vacation. Mauritius is very famous for deep sea fishing which has been practiced by the locals for many years. Big game fishing is a form of leisure fishing, targeting large fish renowned for their sporting qualities, such as tuna and marlin. All the Big-game fishing requires a boat of sufficient size and power to transport the crew to the fishing grounds and back. The prices for deep sea fishing can vary a lot depending of the boat categories. 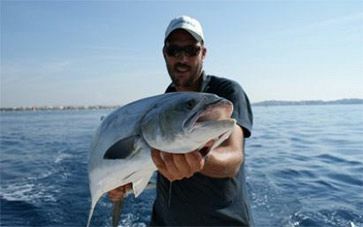 In most cases the Big game fishing trips are offered on exclusive-private bases only, when a small-medium size group can enjoy a great adventurous day of fishing in the open sea traveling in their own private boat. As part of any Big-game fishing trip you benefit personal guidance from the qualified boat’s staff who can teach you all about fishing, show you selection of fishing techniques and make sure you have a fishing trip according to your fishing level and preferences. 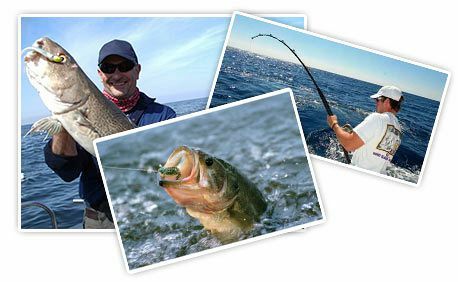 When choosing to go for a Big game fishing trip you can choose between half day and full day fishing trips. Usually as part of the full day fishing trips you get to visit some of the small islets which are found short distance from Mauritius mainland. For example as part of most of the full day Big game fishing trip departing at the North of Mauritius you get to visit one of the Northern Islets – Coin de Mire / Gabriel / Flat. All boats are fully equipped with Penn International reels (30, 50, 80, and 130 lbs line test), Fenwick rods, Lures and Konas, Gaffs, life jackets, VHF ship-to-shore radios, G.P.S navigation system, radio telephone, safety equipments, basic First Aid boxes, fire extinguishers, fresh water showers and toilets, sun deck with canopy & gallery. All fishing gear and tackle is supplied on board, and is included in the daily charter rate of any fishing trip. Anglers will find that they will be adequately equipped with all the usual necessary tackle, gear and equipment when game fishing. 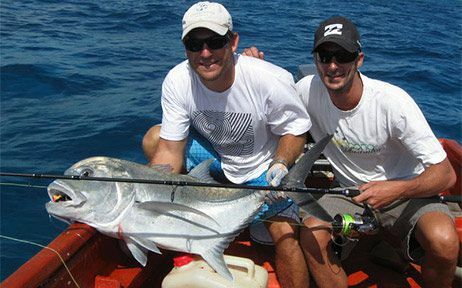 For the most adventurous fishing fans, a few days fishing trip to one of Mauritius Fishing Banks is a true must. When heading to any of these fishing banks you are sure to not only have amazing catches but also to enjoy a once in a life time fishing expedition to unique virgin locations which are rarely visited by any visitor of Mauritius. Sudan Banks (including East Sudan Bank) – a group of underwater high points and reefs off the coast of Africa, known for their good fishing and administered by Mauritius. Nazareth Bank - is a large undersea bank in the Indian Ocean and a small and remote dependency of Mauritius. Saya de Malha Bank - is the largest submerged bank in the World, and the island of Mauritius, and falls into the Mauritian exclusive economic zone. Hawkins Bank - is a large, submerged bank off the Mascarene Plateau. It is considered a dependency of Mauritius. The bank is abundant with fish and Mauritian vessels often fish in the waters in and around the bank. What is a fishing bank? fishing bank, is an area which is shallow compared to its surrounding area, such as a shoal or the top of an underwater hill. Somewhat like continental slopes, ocean banks slopes can upwell as tidal and other flows intercept them, resulting sometimes in nutrient rich currents which attracts abundant of fish.